Recently, we published a piece by Dr. Rada Jones on the 68 Laws of the ER. She returns now for prescient and timely advice to patients on how to stay out of the ER. The best way to do her post justice is to present it as is without editorial or comment. Enjoy! I’m an ER doc. I care for patients. All patients: Those who need to be in the ER; those who don’t; those who wouldn’t be there if they knew better. For them, for you and for fun, I’ve got some tips to keep you happy, safe and away from my ER. Enjoy. Never, ever say “hold my beer and watch this!” Besides “I do!” they are the most dangerous words ever spoken. They’re a harbinger of disaster worse than “Winter is coming.” They have their own section on YouTube – great watch after a rough day. Better than kittens. Still, hold on to your beer. NEVER drink and drive. It’s obvious, but it’s obviously not obvious enough. As per  CDC, in 2016, 10,497 people died in alcohol-impaired driving crashes, accounting for 28% of all traffic-related deaths in the US. They’re still counting 2018. Same with drugs. Any drugs. Legal, illegal, yours, or borrowed. Except for Tylenol. And Motrin. They’re OK.
Don’t tell  your significant other that your life is no longer worth living, just to upset them. If they call 911, EMS will bring you to me. I’ll keep you until you’re legally sober if it takes a week. By the time you’re sober, got your evaluation and went home, your significant other has had a chance to enjoy life without you. Speak wisely. Shoveling the roof is overrated. Especially in winter. It comes with broken heels, fractured backs, and ER trips. The roof is for the birds. And cats. You’re human. Stay on the ground. Your motorcycle? The one you love? I love them too, but I sold mine. My first MCA patient came by ambulance. His leg followed in another car. I’ll get a motorcycle when I get terminal cancer. For now, I’ll stick with my car. Not your thing? At least wear a helmet. If you’ve been coughing for a week and you smoke, go buy honey. Don’t come to the ER unless you have a fever, you’re short of breath or you have chest pain. You’ll cough for at least three weeks. There’s nothing I can do to stop that unless I kill you. That will stop your cough, but it’s illegal. Your twelve-years-of-God-awful-back-pain? Unless something’s really different today, the ER is not the place for it. Especially now, that Percocet has become a 4-letter word. You’ll wait, and wait. You’ll get a lot of rotten looks and a script for ibuprofen — 800 mg every 6 hrs — or acetaminophen — 1000 mg every 6hrs. That’s Motrin and Tylenol. Go get them over the counter. If you have an appointment with your doctor, don’t cancel it to come to the ER  instead because you’re too sick to see your doctor. Unless your doctor is Dr. Seuss, Dr. Pepper or a plastic surgeon, caring for sick people is what your doctor does. Keep your appointments. Don’t separate fighting dogs with your bare hands. Dogs can handle dog bites better than you can. They come from wolves. We come from monkeys. We’re out of their league. Stay out of it or use a prop. Don’t throw gasoline on an open flame  unless you’re looking for a Brazilian wax. NEVER EVER stand around minding your own business. It’s the most dangerous thing known to man. 90% of my assault victims were doing just that. Church is dangerous. That’s where my syncopal patients come from. They go to church, they faint, they fall, they break a hip. Bars are safer. Forget Dr. Google. He’ll drive you insane worrying about improbable things that you can’t pronounce, let alone understand, and he won’t even give you a work note. If you’ve already seen a specialist for your problem, coming to the ER for a second opinion won’t help. I specialize in first opinions. Unless you’re actively trying to reproduce, use condoms. They are cheaper than medications, alimony, and college. The strawberry ones smell better than diapers. Get a flu shot. Beats getting the flu. It won’t give you the flu. If you got the flu last time you got a flu shot, it’s because they happen in the same season. The flu season. 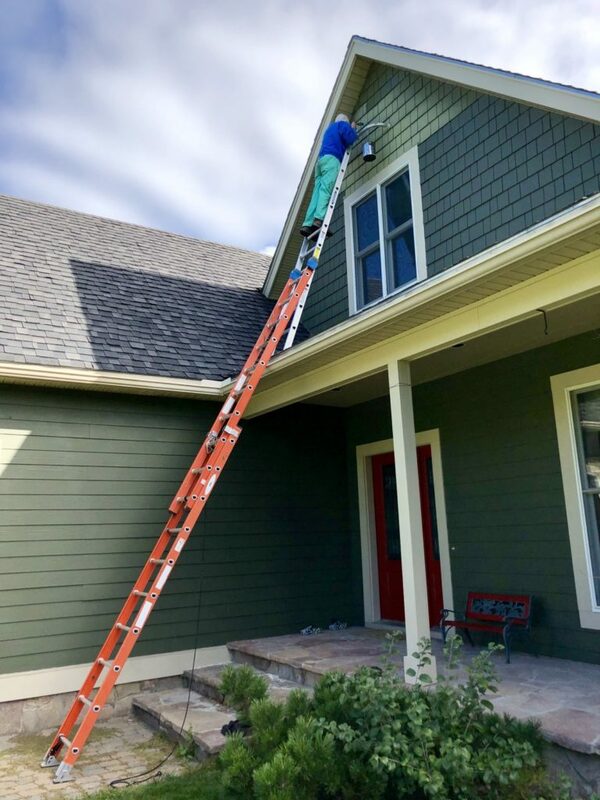 If you walk with a walker, avoid ladders. Turn off your oxygen tank before lighting up. Even better, stop smoking. Don’t eat spicy food if you have diarrhea. You’ll get sensations like never before. Besides rectal lidocaine – which you won’t like – there’s little I can do for you. You’re gonna feel like a reverse fire-spitting dragon. As for diarrhea: One runny episode doesn’t count. Diarrhea is when you run out of toilet paper. Vaccinate your children. The connection with autism is fake. The hack who made it up lost his license. Even if it was true – and it’s not – I’d rather have an autistic child than a dead one. If you trust Jenny McCarthy more than you trust your pediatrician, you should take your kids to her when they’re sick. Use protection. Use the guard of your saw. Use safety glasses when you’re welding. That’s not wimpy – that’s smart. Unlike lobsters, you don’t regrow limbs. Unlike spiders, you only have two eyes. Use them wisely. 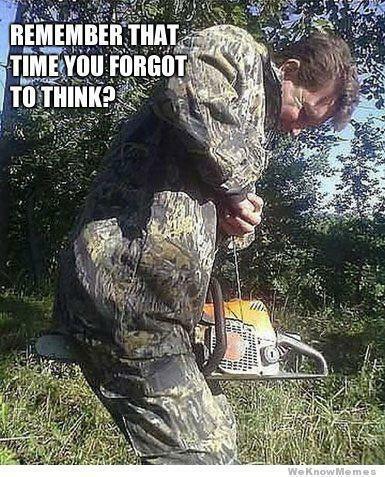 Don’t hold your chainsaw between your legs  to start it. Same with pouring hot coffee. Set the cup down. It feels better. Don’t put on mascara while you’re driving. We’re ER folks. We do emergencies. Our tests look for emergencies. If you come to the ER for anything but an emergency, you’re in the wrong place. Seeing an ER doc for a non-emergent problem is like seeing a cardiologist for your diarrhea. Don’t leave your meds around for your toddler to sample. Check grandma’s house too. Fibromyalgia is seldom lethal  for patients, even though it kills me. Get a doctor. Your own. He’s better than me at managing your blood pressure, your diabetes, your ED (erectile dysfunction). Cheaper too. It will save you time – it’s gonna be a long wait if you’re here for a Viagra script. Plus, I have no free samples. Help others. Volunteer within your community. Focus less on yourself and more on others. It will make you happier and healthier. Get rid of your trampoline. Unless you don’t like your kids that much. Don’t hurt my feelings  by telling me that you really, really hate doctors. Overweight is bad. Bad for your back, bad for your knees, bad for your diabetes. We eat too much and we move too little. Next time you’re thinking Fudge Sundae, try an apple and a walk instead. I know, walking is for the dogs. Get one. People with pets are healthier, happier and have more fun. If you’re calling the ER to ask how busy we are, you don’t need to come. Get a dentist. Teeth are a great investment. They brighten your smile. They make you look younger. They’re prettier than tattoos. They chew your steak! Stop smoking! You won’t set your house on fire. You’ll save money. Your doctor will stop harassing you. You’ll set a good example for your kids. Your car will smell better. So will you. Don’t lock your children in the car. Ever. Not in summer, not in winter, not on Wednesdays. Find childcare or take them with you. Same with pets. Don’t ride your bike while you’re walking your dog. Don’t keep shampoo bottles on the floor. They tend to get lodged in people’s rectums. Don’t keep bleach in soda bottles. If you do, don’t leave them sitting around for your kids to drink them. If you can’t control your anger, punch a pillow. Walls, doors, and windows tend to fight back. Never wear flip-flops to run, walk your dog or climb a ladder. Power tools, tree stands, and ladders don’t mix with alcohol. Same with anything fire related: Fireworks, fire pit, bonfire. Take your meds as prescribed. Your seizure meds, your blood pressure meds, your other meds. Except for other people’s meds. Don’t take other people’s meds. Not even if they’re the same color. Make good choices. Not funny, I know. See below. My husband. Who do you think is holding his beer? Rada Jones is an Emergency Doc. Find her thriller,  OVERDOSE  on Amazon, and her writing on  RadaJonesMD.com.